Remember that watch you didn't go to the store to buy? Your next opportunity for innovation has arrived. Follow this 3D printed wrist watch tutorial to get your wheels turning as you explore the possibilities of functional design. Print the watch face with a pause height of roughly 3.78 mm. When the print has paused, carefully insert the watch crystal into the opening making sure the crystal is laying flush with the surface before resuming. 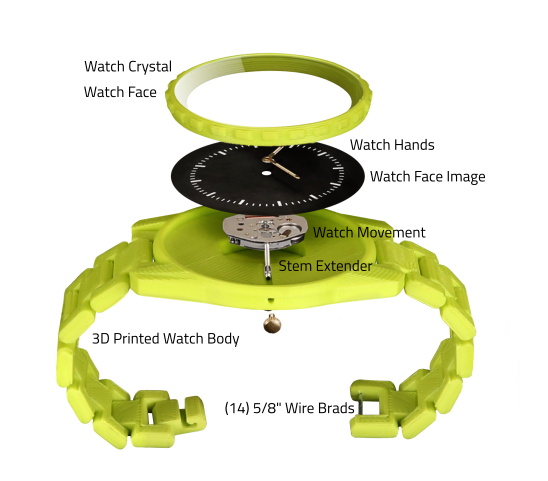 Print the watch body with a pause height of roughly 2.34 mm. When the print has paused, carefully insert a wire brad into each opening taking note of the brad orientation respective to the opening. Print the watch face on your desired paper type. Use photo paper for a glossy finish. Once finished, carefully cut around the perimeter, then finish by poking a hole in the center. Screw the stem extender onto the movement stem. Place the assembly into the watch body and use a marker to mark where the stem extrudes from the hole. Using a pair of wire snips, cut the stem extender so that it is flush with the body.